Months ago D’Banj posted a picture to his instagram that linked to his twitter showing off a bag of garri. Some laughed at the idea while others, myself included, found it borderline fascinating. I will talk first about what garri is, then what my relationship to it is, then a little bit of the sociology of food to show why this matters. It is a tiny grain made by putting cassava through a long a tedious process of washing, grating and mashing, then fermenting, dehydrating and sieving, and finally roasting to dry. There are several ways to consume it be it hot water, cold water, milk, as a cereal, snack or meal across several west African countries. It typically has a sour taste from the fermenting and can be sweetened depending on what you pair with it. I first had garri when I lived in Cote d’Ivoire. The maid we had that time was called Geraldine and she was from Togo. Her cooking skills were decent and she had about 5 solid recipes under her sleeve from her previous job where she worked for a family of 5 that had a chef she learnt a few things from. I somehow and randomly remember her love of “un peu de moutarde” in everything…Whenever I would get done with dinner, I had a habit of walking around the back garden and climbing up the steps to the rooftop patio where I would walk past her room to watch the neighborhood fall silent under the street lights. She always prepared her own meals on a small cooker where she would make enough for herself and Émile le guardian who came in the evenings. A few times she entertained my playful curiosity and would let me taste. She was how I first tasted garri. I immediately loved it. It was a starch, but compared to sadza/ugali, rice and couscous – it was not flat. The sourness had me at the first wince of my face. So unexpected and splendid. She would always make it with sauce gombo avec poisson (okra stew with smoked fish) and from then on wards whenever she made it, regardless of whatever “un peu de moutarde” dish she made for mom and I, she would save me a bit. On days I knew she would be making it I would even come home straight after school no passing go no spending my 200CFA buying Hollywood chewing gum at the Mauritanian boutique or with Diage and his questionably scrumptious sandwich brochette across the highway. Garri and gombo were to be had for lunch! I say all that to say I had not previously known garri and I had, until then, lived a culinarily deprived life. Many of you may or may not know that I have a lot of Nigerian friends..it’s a numbers thing. I remember once expressing nostalgia for it or excitement at having found some at Park and Shop in Abuja. Although I don’t remember her exact words, this friend in no uncertain terms communicated the idea that I was too posh of a babe to be chopping garri AND expressing anything other that superiority over that level of commoner’s provision. I remember vividly, not her words, but the confused feeling in me. It tastes good, I like it, so wettin do you?! Apparently because of how cheap and common it is is, for upwardly mobile [also code for social climbers] people it was/is a no-longer-go zone ESPECIALLY once one becomes an I-just-got-back. Every country/culture/continent has varieties of foods for certain occasions which are socio-cultural and economic markers. Some of these are shaped and determined by religion, geography and contact with other cultures. For example religiously, Islamic communities, because they do not eat pork, tend to consume a lot of lamb. Ratatouille only recently became an acceptable dish in posh French restaurants because it was originally a peasant dish of whatever vegetables could be scrounged with no meat. Because of geography, a landlocked country whose climate is not tropical like Zimbabwe doesn’t really know what to do with a coconut. I distinctly remember growing up when there was a drought and the only corn meal (mpuphu) one could find was the yellow less processed one compared to the popular white/bleached one. The yellow one then popularly remained a reminder of the struggle, and in it’s being less processed, whether on a conscious or subconscious level, and not something to aspire to for dinner. As consumers of food, whether ours or another culture’s, our relationship to what we enjoy is largely nurture NOT nature. Garri can taste good or bad based on what it tastes like in your mouth. This is also influenced by your biological chemistry and what happens when the amylase reacts with the variety of starch derived from cassava. Whether you like the taste of it or not is NOT the issue. Can we talk about learning not to like something because of insecurities and keeping up appearances? It is always equally sad to see someone pretend not to like something as it is to see them pretend to. Both seem like such a deception of self, not even worth the pretense. All of the above bring me back to why Koko Garri is so important. One thing we can collectively agree to be problematic is that we neither produce nor consumer enough indigenous goods as a continent. Of course there are several historical, institutional and infrastructural barriers influencing this, BUT there also aren’t enough of invested in ourselves as a market. Coming from a country that was/is largely sustained by an agricultural economy, the richest black people I have ever seen or known were farmers or more generally those who invested a long time ago in making SOMETHING needed by others. Not new money, flashy cars and loud money, but the still waters run deep kind. Long and lasting money. They were/are the people who are invested in the laborious, but high yielding industries that produce food. No matter where you are in Africa, people must eat. The rich people have sophisticated and picky palettes and can consume western imports – let them eat cake! Everyone else does what they can with the staples which tend to be locally grown and affordable. Everyone else is the majority so if you can feed the majority on what they majoritively eat you are exercing the capitalist winning strategy of majoritism. Everybody wins. I read on a blog today [on his music career from Mo’Hits to Good Music and now…] where D’Banj was described as “former Big Fish in Small River, now Miniscule Goldfish in the Atlantic Ocean” and I admittedly chuckled at the reference. What is serious business, however, is investing in agriculture and better than that is food and better than that is a staple one. If I ever had to predict someone of the cusp of long money and impending membership into the [African] Billionaire Boy’s Club – this would be it. The thing about being a visionary [for/from Africa] is people WILL laugh at you being a Louboutin and Guissepe Zanotti wearing entertainer when they think that is merely what you are. Only when your tree is bearing fruit and your cup runneth over do they want to jump on the bandwagon. The season for sowing seeds into agriculture and investing in ourselves and what we consume is now (before the Chinese get to it too). The hard work and patience paired with faith and foresight is what determines who has to soak their garri in cold water or milk and honey. Anywhoo, I got my personal bag of Koko Garri and I cannot wait to partake! I had a phase where I was OB-SESSED-uh with recycled glass beads. 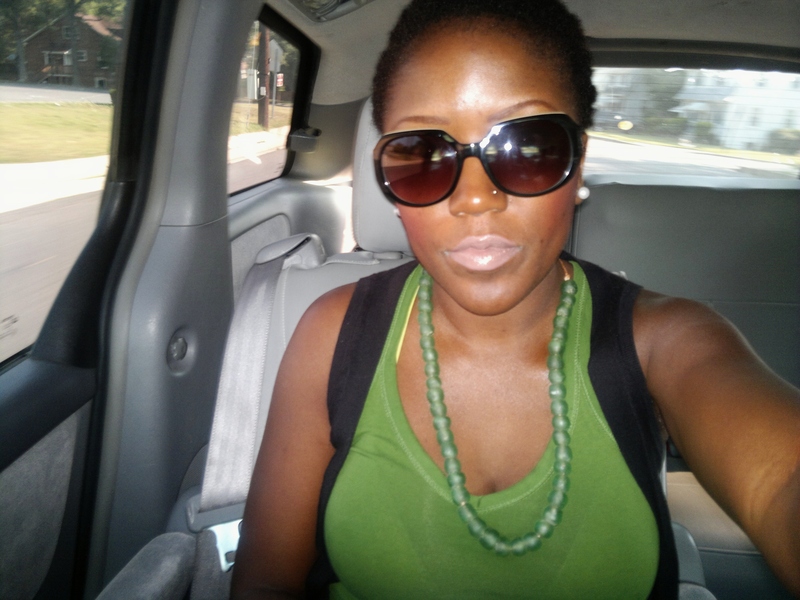 My darling @naijadiva was going to Nigeria and that was all I wanted. I looked up pictures and sent them to her. She brought me 3 or 4 different colors and I went to Beadazzled on Connecticut and got some leather rope and clasps. I wish i’d gotten more creative and added some brass beads and really put some slamming stuff together. Now that i’ve said it…. Is there an option to skip? Any sick days?! No? Ok lol…. Well throughout this challenge and on this day I realized how much Africa surrounds us if we tune into it even in the Diaspora! This whole week was a little stretched as I had a conference to go to, but I remember in my morning grogginess going to the Starbucks to get some coffee and the guy who took my order and rang me up was Toure. He was very nice – not necessarily because he was African or he knew I was – it was just his nature. He could very well have been rude – we are all entitled to be whatever we want to be. Yes my Africans you can be rude too so long as your personal [negative] traits aren’t sweepingly generalized and applied to a stereotype about us collectively. We are all complex and unique individuals and should be free to do so :). Later on when I went for lunch there was a lady speaking Amharic animatedly [not necessarily because she is African] on the phone…. 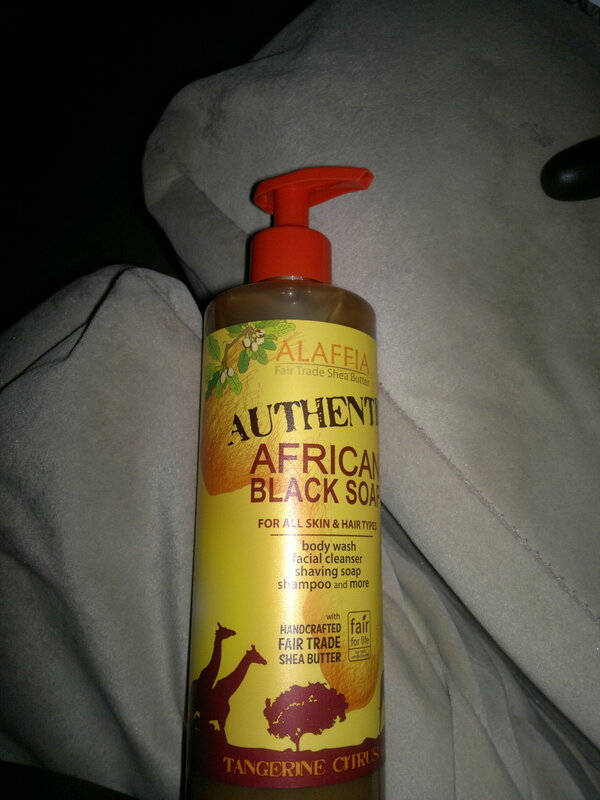 The description on the bottle is a little better than the one on the shea butter from afrofoto day 7. It continues to talk about other ingredients like shea butter and palm oil and the process in its entirety. I did have a little bit of an issue with the use of the word “authentic”, but didn’t want to get tangled in semantics. It can be used as a body wash, facial cleanser, shaving soap, shampoo and more. I only use it for body so far and might try the hair, but not my face. I’m pretty rigid about what I put/use on my face and i try not to blur the line in body parts. It’s made by a “Certified Fair Trade Cooperative” in Togo.